Did you know 50% of people admit to some form of anxiety visiting the dentist, with roughly 1 in 6 avoiding dental care altogether because of it? To ease anxiety dentistry has developed sedation methods that help patients relax during dental treatment. Many can achieve relaxation with an oral sedative taken about an hour before a visit. Some with acute anxiety, though, may need deeper sedation through an intravenous (IV) injection of medication. Unlike general anesthesia which achieves complete unconsciousness to block pain, IV sedation reduces consciousness to a controllable level. Patients aren’t so much “asleep” as in a “semi-awake” state that’s safe and effective for reducing anxiety. While there are a variety of IV medications, the most popular for dental offices are the benzodiazepines, most often Midazolam (Versed). Benzodiazepines act quickly and wear off faster than similar drugs, and have a good amnesic effect (you won’t recall details while under its influence). While relatively safe, they shouldn’t be used with individuals with poor liver function because of their adverse interaction with liver enzymes. 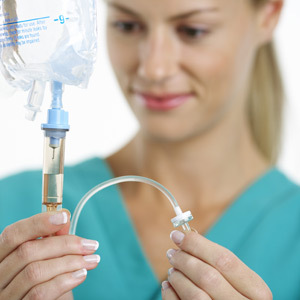 Other drugs or substances are often used in conjunction with IV sedation. Nitrous oxide (“laughing gas”) may be introduced initially to help with anxiety over the IV needle stick. Sometimes pain-reducing drugs like Fentanyl may be added to the IV solution to boost the sedative effect and to reduce the amount of the main drug. If we recommend IV sedation for your dental treatment, there are some things you should do to help the procedure go smoothly and safely. Because the after effects of sedation may impair your driving ability, be sure you have someone with you to take you home. Don’t eat or drink anything after midnight the day before your appointment, and consult with both your physician and dentist about taking any prescription medication beforehand. Wear loose, comfortable clothing and don’t wear contact lenses, oral appliances like dentures or retainers, watches or other jewelry. Our top priority is safety — we follow strict standards and protocols regarding IV sedation and you’ll be carefully monitored before, during and after your procedure. Performed with the utmost care, IV sedation could make your next dental procedure pleasant and uneventful, and impact your oral health for the better. If you would like more information on IV and other forms of sedation, please contact us or schedule an appointment for a consultation.